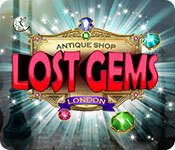 Antique Shop: Lost Gems London is rated 4.3 out of 5 by 24. Rated 5 out of 5 by KarenMora from Now this IS different Forget the story. This game has so many new features I have not seen in other match games. Slide the row, rotate some spaces, move the blocker(? ), TRY this one. Now the drawing is wonderful - you won't see anything you recognize of London. If they put an HO game in between the match three, you'd have a collector's edition I would buy! I need to see if there's anything else by this company! Rated 5 out of 5 by IndigoStars from Different strategies I really enjoyed this game. The tokens are beautiful and the boards are interesting. I particularly liked that the various power-ups involved moving elements of the board about, like the rows or the individual blocking stones. I played on casual so I don't know how frustrating that might be when playing limited moves. I played through to the end and thoroughly enjoyed it! Rated 5 out of 5 by gramioli from Unique Match 3! I loved this match 3 for the unique twists and challenging play. It was so different from the usual match 3. You can choose limited moves, my favorite way to play. With this match 3 you are really challenged to strategize your moves so you don't run out of them. This was so much fun and I hope we see more of these from this developer!! Rated 5 out of 5 by blipi69 from Great Match3 Game H really liked this one. tasks and graphics are really nice. Storyline exciting. I would have wished the tiles itself a bit more detailled - but I enjoyed this game more that all other games of this genre I played in this year. Rated 5 out of 5 by denniann2 from a great M3 game. you can play casual or not. there is a hint option on the levels. i didn't understand it though. you are looking for your cousin that has disappeared into a book and being held there and you need to do the levels to unlock the different places in london to get her out. 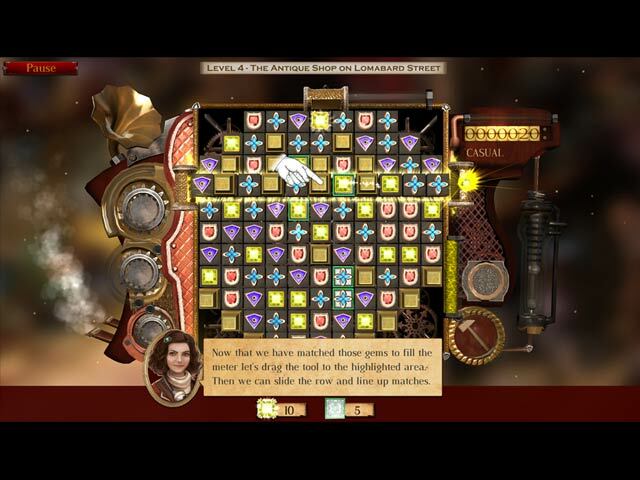 Rated 5 out of 5 by mikesilverman from LOVE THIS GAME This is a beautiful , entertaining, fun, and fascinating game. If you enjoy this type of puzzle game where you move tiles on a board to match them and remove them, this may be the best one so far. There are many elements that come together to make this a great game. 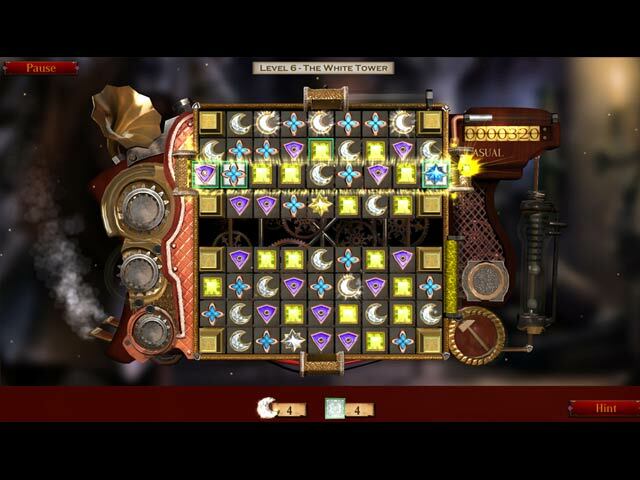 Each board has goals to achieve , such as clearing certain types of tiles, and if you choose to play it with a limited number of moves for each game board the challenge is achievable and satisfying when you do. What makes this fun are the variety of "tools" you can use to move tiles around the board. There are spinners which allow you to spin entire blocks of tiles, tools that let you move "blocking" tiles out of the way, tools that allow you ( for about 5 seconds ) to freely move any object tile to any location on the board, tools that let you slide entire columns or rows , and also a hammer to destroy any single block, and tile bombs you can create by matching 4 or more tiles. The game's graphic qualities are excellent. The backgrounds are beautiful highly detailed scenes from around London, and the movement and animation of the board and game tiles is very smooth and sleek. I really like that. Too many of these match-3 games suffer from stilted movement that detracts from the enjoyment of the game. This one however has no such failing. I highly recommend this game. Rated 5 out of 5 by melmill2552 from Excellent Match 3 I try every Match 3 game that comes along, as I am a big fan. I loved the game mechanics of this one in particular, so had to write a review. The previous game 'Egypt' had glitches and I ended up deleting it. I hoped this one would not have any. I played it right through without a problem. It requires lots of strategy to get through, which I like. It lends itself to counted Match 3 because of this, but you can play without it if you want. Rated 5 out of 5 by Marja67 from Matchless Match 3 A big 'wow'. Love this game. Unique is right for game play. Different way to match gems. Rated 5 out of 5 by Luvago from I couldn't stop playing I loved this game so much I had to play nonstop until demo ran out & promptly bought it. It is like a breath of fresh air M3 wise, as it has an interesting if not slightly strange story, that takes you to different places/rooms around London. I liked the graphics. I played relaxed (until I get used to the rules).The tutorial is excellent & easy to understand (whilst it is turned on) & shows what to do on each level ie goals - remove silver tiles & so many gems etc. 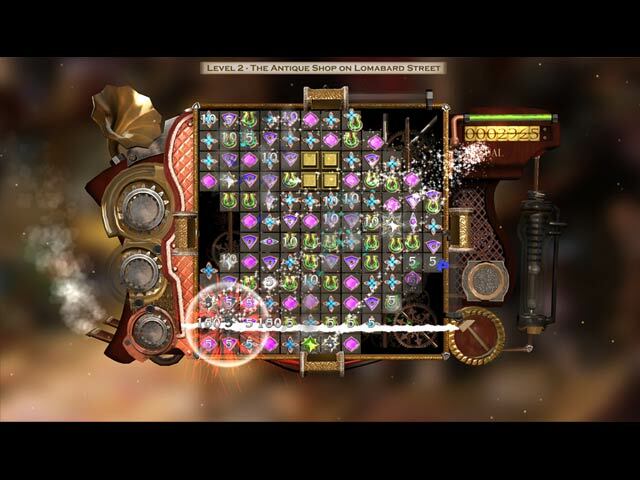 There are satisfying explosions, you are told when you have enough gems to upgrade, also swirling "things" that can rotate & also a slider, hammer etc - but not all on the same level @ once. Also crates that hide gems, key to unlock more board & more. There are also achievements which are earned, which help further. I think this is worth trying.